“The main criticism of the evangelical can be put in this form: It is a claim to a continuing of inspiration. The mystic in a sense is claiming that God is dealing as directly with him as He was with the Old Testament prophets; he claims God is dealing with him as He did with the Apostles. …The mystic says he has received a new and fresh message and that he is in a state of direct inspiration…. Now we believe that God gave a message to the prophets, He gave a message to the Apostles; but we say that because God has done that, it is unnecessary that He should do that directly with us. This entire section is very much worth reading. It’s found on pages 89-92 of Life in Christ. It is very important to remember that there is historical progression in Scripture. The Bible is a historical book that records stories from the beginning of the world to the 1st century AD (and beyond, if you think of the prophecies). But the Bible isn’t a regular history book; it is what we call redemptive history. That means the Bible contains the inspired history of God’s redemption of his people. Hand in hand with this truth is the fact that there is also a progression of God’s revelation in Scripture. As time marches on, God slowly but surely reveals more of himself to his people. There is progression in God’s revelation from Genesis to Revelation. These are some assumptions of biblical theology gleaned from Scripture. Richard Lints, The Fabric of Theology, p. 278. God is not known through his essence – but “through his effects and his names, by which he wills to reveal his virtues to us” (Cocceius, Summa Theol). The nature of God can be known, then, “according to the manner of divine Revelation, and the measure of our knowledge” and is to be discussed in terms of the name of God and in terms of the definition (Ibid.). 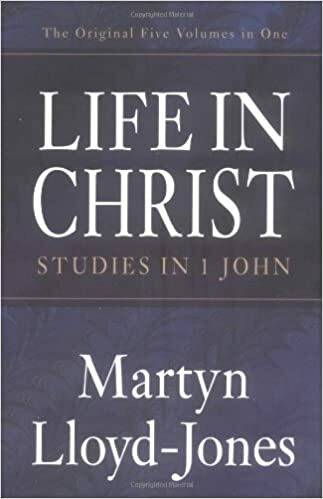 Thus, language about God proceeds cautiously, frequently according to a negative manner; as when God is called “incomprehensible” or “infinite.” These identifications of God are intended to “remove far from him the imperfections of creatures” (Trelcatius, Scholastic Methods). In other words, our human minds are limited, darkened by sin, and finite. Therefore we cannot fully comprehend God nor can we perfectly describe and explain him. Even our best theology is imperfect. However, because he has revealed himself (in creation but more specifically in his Word and in Jesus), we can apprehend him and know him in a true and saving way. It’s not because we deserve it or because we’re smart, super intelligent, or supremely wise. It’s because he is gracious. It is his good pleasure to reveal himself to his people and give them the hearts to believe his Son (cf. Matt. 11:27, Luke 10:22, & 2 Cor. 4:6)! 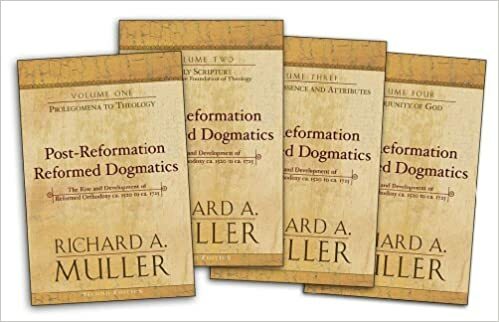 Richard A. Muller, Post-Reformation Reformed Dogmatics Volume 3: The Divine Essence and Attributes (Grand Rapids, MI: Baker Academic, 2003), p. 165. 1) Revelation helps us see our situation in its true perspective. We are living between two worlds: the first heaven and earth, which are destined for destruction; and the new creation, to which we already belong as God’s holy city, the bride now being beautified for her Husband. Jesus’ Revelation to the churches through John is given to help us navigate the paradoxes built into the ‘betweenness’ of our situation. Revelation is also brutally frank in revealing the call to follow Christ as a call to suffering and even death. More than this, Jesus shows us that his victory over the enemy has blazed the trail for our victory. 2) Revelation helps us see our enemies in their true colors. Revelation calls the church, Jesus’ witness, to exercise wise discernment, lest we be taken in by an impressive image that masks an ugly and empty reality. The enemies include the beast (the power of government), the false prophet (religious deception), and the harlot (the idolatrous allure of material affluence and social acceptance). 3) Revelation helps us see our Champion in his true glory. Whenever Revelation works on us as God intends it to, we trust, love, and fear Jesus more. The purpose of its graphic portrayals of the dragon’s heavy artillery is not to haunt us with nightmares or keep us awake with night sweats. It is to direct our eyes and hearts away from ourselves, to focus instead on Christ, the seed of the woman who crushed the ancient serpent’s head and now sits on God’s throne. He is the lion of Judah, the slain Lamb, the captain of heaven’s armies, the faithful witness, the husband who lives his bride, etc. 5) Revelation helps us endure suffering, stay pure, and bear witness to Christ. The first century churches that John was writing to faced suffering and even martyrdom. He wrote to encourage them to press on through suffering. He also wrote to warn us of the devil’s appealing power and alluring guise, helping us fight spiritual seduction. Finally, Revelation keeps us from withdrawing into a religious ghetto and keeping the gospel a secret. The church is called to be Jesus’ witnesses, fearless in engaging the culture because we are confident in his care for as long as our mission on earth lasts. This is an excellent summary of how Revelation applies to us, affects us, and encourages us in the Christian faith. I recommend reading this entire excellent chapter of this excellent book: Triumph of the Lamb by Dennis Johnson. 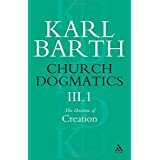 In III.1 of Church Dogmatics Karl Barth spends quite a bit of time discussing the text of Genesis 1 and the days of creation. In his discussion of day 3 and the separating of the waters from land (Gen. 1:9-10), Barth elaborates on the “waters” in a fascinating (sort of) redemptive historical way (III.i.IX.41.1). Notice how he goes from Genesis 1 to Paul’s ministry, back to Genesis 1, and then to Revelation. K. Barth, Church Dogmatics III.I, p. 148-9. If you haven’t read Packer’s Fundamentalism and the Word of God, I’d suggest putting it on your “to read” list. Here’s a section from it that explains how God reveals himself in his acts (i.e. the Exodus) and also in speech (i.e. the Prophets) – and these go together, as Packer notes. Packer’s helpful argument also has to do with the necessity of Scripture. J. I. Packer, Fundamentalism and the Word of God (Grand Rapids: Eerdmans, 1962).